Since we are back from California Wine Country adventure, my weekend wine reviews for a few weeks will cover not only wines, but the winery and wine tasting rooms. One of our first stops was at Ancient Peaks Winery. The tasting room allowed you to taste 5 wines for $10.00 – and one tasting fee is waived with the purchase of a bottle of wine. We had no trouble purchasing a bottle or two! All of the wines were excellent. My tasting notes are limited to just that – they were excellent! So, I will be referring to the description that is given on the tasting sheet. 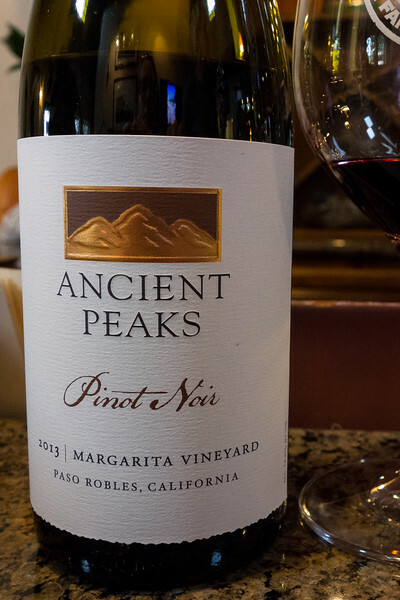 The Ancient Peaks Pinot Noir, 2013, retail $32, club price $25.60. They say: aromas of plum and nutmeg with flavors of dark cherry and tea. Pair with smoked salmon. 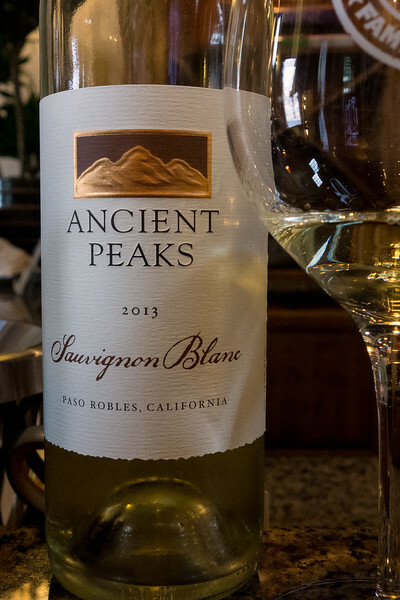 Ancient Peaks Sauvignon Blanc, 2013, Paso Robles, California. Retail $14.50, club price $11.60. They say: Bright bouquet of citrus with flavors of grapefruit and fresh pear. Brilliant with sushi. Ancient Peaks 2011 Oyster Ridge, Paso Robles, California. (48% cabernet sauvignon, 44% merlot, 4% petite sirah, 4% malbec). Retail – $50, Club – $40. They say: Our flagship wine opens with a bouquet of plum and violets with a hint of toasty oak. Juicy flavors of black cherry and blueberry embraced by trailing accents of vanilla and spice. Compliments grilled rib eye with garlic and rosemary. 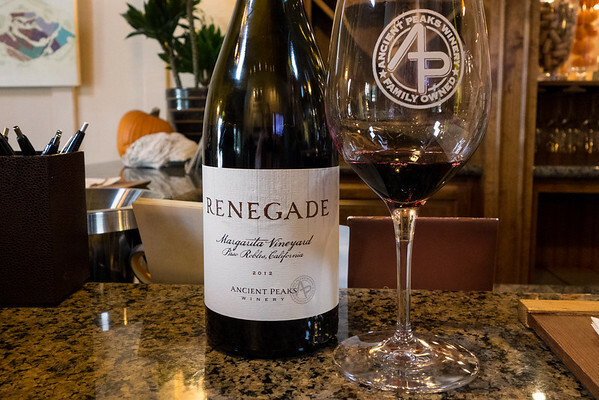 Ancient Peaks 2012 Renegade, Paso Robles, California. (71% syrah, 24% malbec, 5% petit verdot). Retail – $23, Club – $18.40. They say: Lavish black fruit with notes of plum and cassis. Good eats with smoked pork shoulder. 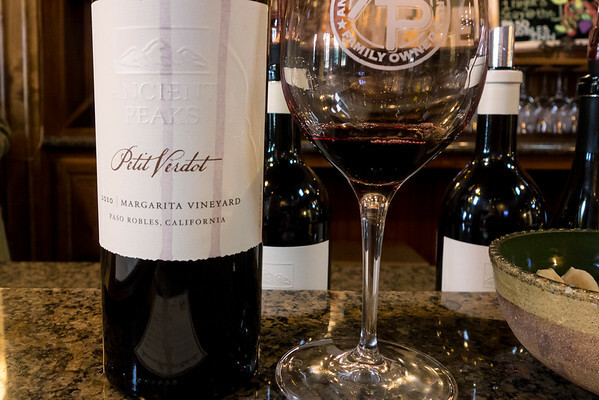 Ancient Peaks 2010 Petit Verdot, Paso Robles, California. Retail – $35, Club – $28.80. They say: Rich aromas of cherry and black currant with a hint of lavender. Intriguing notes of black tea, ripe dark fruit and toasty oak. Pair with barbecued pork spare ribs. 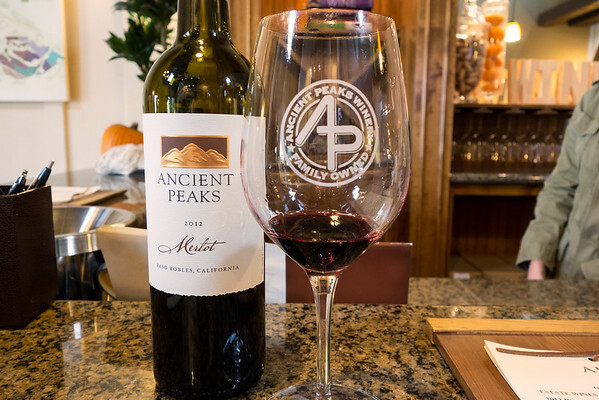 Ancient Peaks 2012 Merlot, Paso Robles, California. Retail – $17.00, Club – $13.60. They say: Aromas of blueberry with smooth blackberry and mocha. Pair with grilled pork chops. We thoroughly enjoyed our wine tasting at Ancient Peaks. Kendra was very knowledgable and very patient with all my photo set ups! The wine was all excellent, I declared each one my favorite, until I tried the next one, and then it was a new favorite. 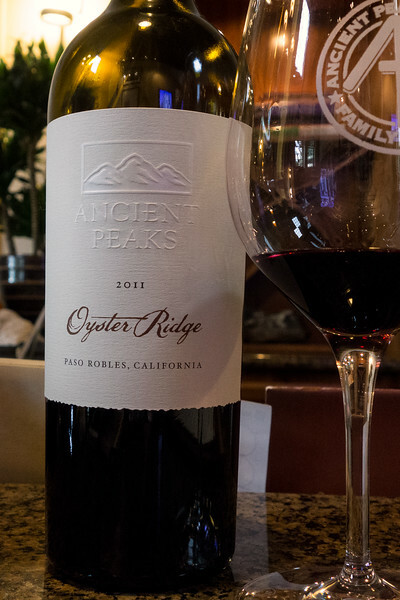 The 2011 Oyster Ridge was of course amazing, and I think my second favorite was the 2012 Renegade.